Learning about Pyramids is like Knowing Your Spiritual self | My Journey So Far…. When I was first taught about Pyramids, in my school, I was told that they are used to store mummies of Egyptian kings. I believed it till date, until my curiosity took over and I researched through books and internet to learn more about Pyramids. If you still believe that Pyramids are just made to satisfy some Egyptian King’s larger than life Ego, then you have to read the post below, because the case is totally different. It’s so unfair to teach our kids a history that is half corrupt and half ill rotten to fill their mind with garbage. But, why? Maybe, it’s got to do with the regimes who have ruled us and the way they want to portray our history. We always believed that our ancestors evolved from apes and we are actually much more advanced than them. But, what if it’s not true? What if they were much more advanced scientifically, spiritually and humanely than us? Egyptian pyramids have proved all our hypothesis wrong and made a strong point favoring the high intelligence of our ancestors. Till date none of us has come up with a way to replicate a Pyramid. Then how did our ancestors made such huge structures? Pyramids are not only just a triangular structure erected in the dessert, they were actually build around the civilization of Nile river, in a way that all three largest pyramids aligns with the Orion constellation. It is constructed in such a way to align itself with sunrise and sunset of every new cycle of Sun. What amazes me is that most of the people correlate Pyramids with Mummies and dead bodies, irrespective of the fact that they are never found in them. Their was never a Mummy placed in Pyramids. 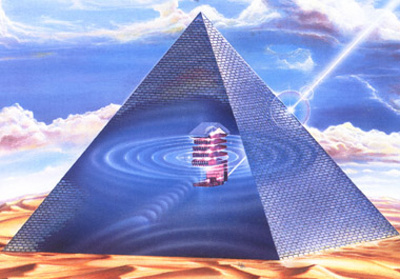 In fact Pyramids were built to be used as a machine kind of structure to vibrate and resonate high frequencies. If you look inside of a Pyramid, they are like inside of a machine which uses sound as it’s basic theme and convert all the energy into positive vibes or frequency. Now, what kind of frequencies do they resonate? Our ancestors understood the importance of being one with nature. They were quite advanced spiritually and have understood the true happiness. Just like in Hindu vedic culture our whole body is considered as a temple and is further considered to be represented through Seven Chakra, so does the Egyptian pyramids are built to influence those Seven Chakra through sound and frequency. If you saw the Seventh and the higher most Chakra in our body, it is triangular in shape with three dots joining together to denote Shakti, the ultimate divinity, so are the pyramids. They were considered as a means of communication with the higher self, and to balance the harmony in world. Now, we have lost that touch with our higher self. Our spirituality is now limited to going to temples, mosques and churches. We have forgotten, that fundamental spirituality is actually derived from humanity and harmony. One day will come when we will understand this and maybe that day we will attain the knowledge which our ancestors have already captured in these Pyramids. Pingback: The Color of Love | My Journey So Far….